If you have exhausted all forms conservative treatments, resting, cold compression therapy, physical therapy. And, you still find yourself in pain as well as limited use of your shoulder for daily activities. You and your doctor may decided to move forward and have you under go surgery. 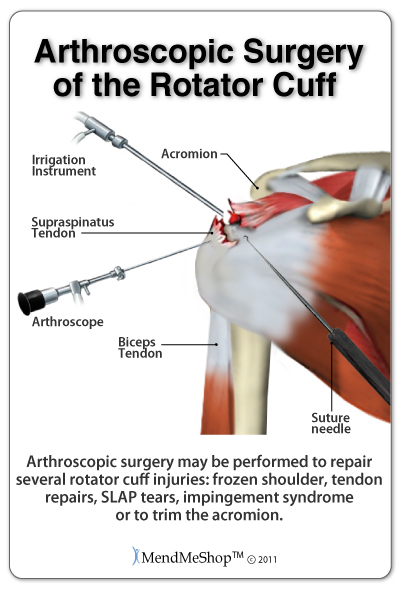 Beginning the next chapter of your shoulder recovery, as surgery is not the end of your journey. Your rehabilitation efforts will have an important impact on how soon you can return to living and enjoying your normal daily life. No two rehabilitation plans are alike - The less invasive your surgery is, the quicker your road to recovery will be. The goal of a rehabilitation plan is to manage pain and swelling while improving function, strength, and range of motion. Ultimately, you will regain strength in your shoulder and rotator cuff tendons to be able to use your shoulder normally and return to full activity. You will most likely spend a lot of time with a physical therapist after your surgery, but as your healing progresses, emphasis will be placed on your personal at home treatment. The success of your rehabilitation will depend on your dedication to working with your doctor and physical therapist while also managing your recovery on a daily basis at home.